[CONTINENTAL CONGRESS]. Newspaper. Postscript to The Pennsylvania Gazette, [November 2, 1774] (No. 2393). Philadelphia: David Hall and William Sellers. 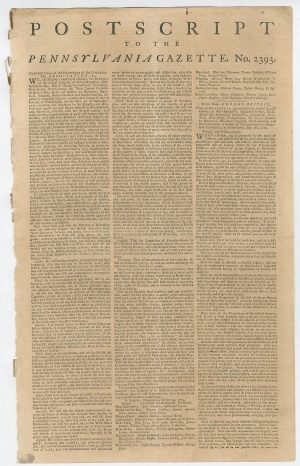 Front-page printing of “The Association” (October 20, 1774, but misdated in this issue as October 24), signed in type by Peyton Randolph and delegates from twelve colonies, including George Washington and John Adams. With a front-page printing of Address “To the People of Great-Britain” (October 21, 1774), written by John Jay. 2 pp., 10 x 15½ in. The Pennsylvania Gazette (1728-1800) was first published in 1728 in Philadelphia. Benjamin Franklin and Hugh Meredith purchased it in October 1729. Franklin became sole owner by 1732, printing the newspaper and often contributing articles under pseudonyms. His paper became the most successful in Pennsylvania. In 1748, he entered into partnership with David Hall. The Gazette printed the first political cartoon in America, “Join or Die,” designed by Franklin, in 1754. After Franklin sold his printing business to Hall in 1766, William Sellers became a partner. 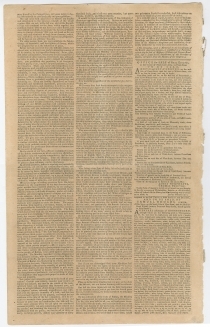 During the 1770s and through the Revolutionary War, the Pennsylvania Gazette was one of the most prominent and influential newspapers in the new nation. When the British Parliament passed the Intolerable Acts in 1774, many American colonists viewed them as a violation of the British Constitution and a threat to the liberties of all of British North America. In response, colonists proposed economic sanctions against Great Britain in the form of non-importation, non-consumption, and non-exportation of goods. On September 30, 1774, the Continental Congress meeting in Philadelphia appointed a committee, consisting of Thomas Cushing of Massachusetts, Isaac Low of New York, Thomas Mifflin of Pennsylvania, Richard Henry Lee of Virginia, and Thomas Johnson of Maryland, to develop a plan for implementing the non-importation, non-consumption, and non-exportation resolves. On October 12, the committee submitted a report, and Congress debated it over the next week. On October 18, Congress approved the plan, and on October 20, the delegates signed “The Association,” a system for implementing a trade boycott with Great Britain. According to its provisions, on December 1, 1774, the American colonies would not longer import any goods from Britain, Ireland, and the British West Indies. It also threatened an export ban if the offensive acts of Parliament were not repealed by September 1775. On October 21, Congress also approved an Address “To the People of Great-Britain,” appealing to a shared history and culture, and warning of the danger that a corrupt Parliament posed to all British citizens.